The Lines Quiz is always my favourite review game, but after doing it every lesson for over a year it is a bit much! So my number 2 review game is Soldiers & Ninjas! 1. Select 9 students to become the soldiers. They stand in rows to protect you, the king or queen! 2. The other kids, the ninjas, have to answer one soldier's question from each line and then beat that soldier at �gRock, Paper, Scissors�h before moving on to the next line. You can choose the questions from previous lessons e.g. What's your name? Where do you live? or any thing really. 3. If they make it to the final soldier, i.e. they have answered all the questions and beaten one soldier from every line at �gRock, Paper, Scissors�h they must answer a random English question from the king or queen! 4. 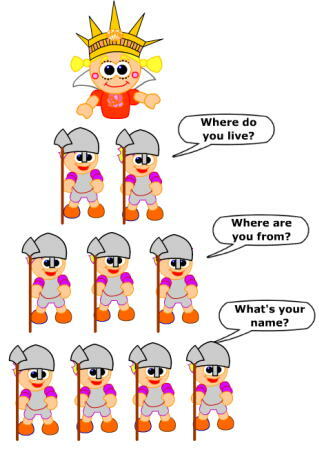 If they can answer this question in English correctly and they beat the king or queen at �grock, paper, scissors�h they become the new king or queen! Select 4 volunteers. These students are the soldiers and will be asking the questions. Get the 4 soldiers to stand in a straight line across the room (about 10 feet apart). You are the King and sit in your throne about 10 feet behind the 4th soldier. Assign each of the 4 soldiers a question (eg. What's your name?/ How old are you?/ How are you?/ What sports do you play?). However, if at anytime a ninja loses at janken to a soldier they must return to the starting line and repeat the whole process again (cue cries of exasperation). If a ninja manages to get passed all 4 soldiers they get to have a showdown with the King! You can ask them any question that you've covered in class, eg. What's your favourite food? The ninja answers and you janken. If the ninja wins you have been dethroned and the ninja is now the King (cue much jubilation) and you must join the other ninjas in an attempt to get passed all the soldiers to reclaim your throne. If you win, of course the ninja must return to the starting line again (cue more cries of exasperation). 20 minutes or so is about right for this game although no doubt the students will want to continues playing. The good things about this game is that it gives the opportunity for the students to revise/drill dialogue in a fun way without them even realising it. As it takes a very lucky ninja to get passed all four guards without losing at all, students will no doubt have to answer the same questions several times. Now and again let other students become soldiers so they get to practice asking the questions. Variations? You can have two, three or more lines of soldiers asking questions for bigger classes. You can also use props such as a crown for the King which adds to the fun. If ninjas and soldiers aren't cool enough, you can always build the game around another theme (eg. Lord of the Rings with hobbits and orks). A couple of things to watch out for. The queues for ninjas waiting to battle with the soldiers can get a bit congested at times. The students tend to wait patiently but this problem can be avoided altogether by having another line of soldiers. This will get things moving much quicker. Also, take the opportunity to walk around and check the students pronunciation and prompting when necessary. A bit of a long-winded explanation which would be aided greatly by some photos but this game works great! Try it!!! Mat Gutch Kochi Prefecture, Japan. I used this game for my 6th grade students at one of the elementary schools that I teach at in Japan and they loved this game. I have one class that never participates and is always disruptive, but playing this game got them really involved and they ended up being my best class of the day! It can get a bit noisy, but it really works well to get the students more involved...despite the long wait time.